Abby the Librarian: 2015 Newbery Committee, Here I Come! The Newbery Award is administered by the Association for Library Service to Children (ALSC), a division of the American Library Association (ALA). 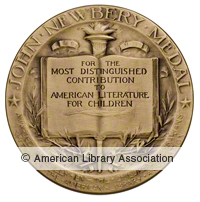 Newbery Medal image copyright ©2013 and used with permission of ALSC/ALA. Well, the ALA Election results were announced last Friday and I am thrilled to announce that I have been elected to the 2015 Newbery Committee!! I'd like to thank everyone who voted in the election. It is so important for ALA members to make our voices heard within the organization. And congratulations to my fellow Newbery committee members and the elected members of all the other ALSC and YALSA selection committees! 2015, here we come! !